I love that phrase: “Let your conversation be always full of grace.” It reminds me of a slogan I saw in Hawaii: “Spread the aloha spirit.” Spread the grace spirit! How? As always, Jesus is your guide. Think of Jesus and the Samaritan woman (John 4) . When she says, “I have no husband,” Jesus could have attacked her for her immorality (turns out she has had several husbands and is not married to the guy she is living with) but instead He compliments her for her candor! “Full of grace” means “gracious” and “graceful” speech, but it means more than that. As James Montgomery Boice points out, the way Paul uses the words in this verse could also mean “let your conversation be full of the doctrines of grace.” In other words, “Let a lot of what you talk about be God’s grace.” What an encouraging subject! Now think of conversations you hear in our society, on radio talk shows, or at work or school. Too often they’re full of insults, seasoned with sarcasm; or full of judgment, seasoned with self-righteousness; or full of anger, seasoned with crudity. There is a blight in American society which has taken root in our souls and in our mouths: Vulgarity. Whether it comes from white shock-jocks or black hip-hop artists, vulgarity demeans people, robs them of dignity. How have we come to this place? What about you? Let’s start a movement to change vulgar language and harsh language to grace-filled language. As part of this Grace Immersion, try this: For at least the next fifteen days, until the end of this study, only speak grace-filled words. After all, Paul says to let your conversation be always full of grace. That means more than just good manners (although that’s included!). Stay away from vulgar or harsh words (like cursing). Be encouraging. Praise others regularly. Be specific with your encouragement. Smile and look into the eyes of anyone you talk to. Offer mercy at every chance. Be quick to forgive. Remind people of God’s love for them. If you need to correct or offer suggestions, do so with a gentle, grace-filled spirit. Speak the truth in love, but never gripe or complain. Do this not as a duty; do this as a response to God’s grace to you! In simple terms: You give the grace you got from God! 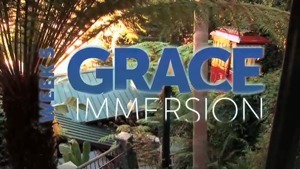 The Grace Immersion means more than just learning about grace. 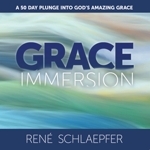 It’s about really immersing yourself in a grace-filled lifestyle, and your words are part of that immersion! As Justin Taylor puts it, “We think words, hear words, speak words, sing words, write words, and read words — all the time. Every day.” So the words you choose to use will shape your life and the lives of others more than almost any other single factor. Rudyard Kipling said, “Words are, of course, the most powerful drug used by mankind.” What kind of “word-drugs” are we using in our culture today: Words that heal, or words that addict and destroy? How so? Do you agree with Maya Angelou’s comments? Why? Again, ask God to help you show grace specifically through your words for the next 15 days!